What is the Average IQ Score? A Good IQ Score? A Bad IQ Score? Intelligence Quotient (IQ) tests are a standardized method of assessing reasoning skills and comparing these abilities to those of other people in the same age group. Ultimately, an IQ test is meant to evaluate relative intelligence. These tests are often used or adapted as entrance exams for gifted and talented programs around the United States. But what do these scores mean, and how are they determined? Read on to learn everything you’ll ever need to know about IQ tests and scores. We didn't say the IQ test questions were easy! ## What is the average IQ score? Technically, the average score on an IQ test is set to 100. This means that a score of 100 indicates you have average intelligence for your age. However, psychologists typically classify a range of 95-105 as normal or average. Between 2002 and 2006, IQ studies were conducted in more than 80 countries by British professor of psychology Richard Lynn and Finnish professor of political science Tatu Vanhanen. The study found that the true average IQ score in the United States is a 98, tied for 9th place with countries including Spain, France, Hungary, Latvia, and Denmark. The countries with the highest average, according to the IQ study, were Hong Kong and Singapore, with an average IQ score of 108. The study found a correlation between national income and the average IQ score of a nation’s population. Lynn and Vanhanen argued that average national IQs contribute to national wealth and economic growth rates. So what is the average IQ score? Based on the study by Lynn and Vanhanen, it’s around a 98 in the United States, but varies throughout the world. However, the mean score is set at 100 with a standard deviation of 15. ## What are high and low IQ scores? Now that we’ve answered the question, “What is the average IQ score?” you may be wondering what IQ scores are considered particularly high and low. A low IQ score is considered to be any score that is 70 or below, a category that encompasses about 2.2% of people. In the past, a low IQ score was regarded as a benchmark for intellectual disability. Today, IQ tests alone are not considered reliable enough to diagnose a mental disability, and other factors must be considered as well. High or genius-level IQ scores are 140 or above. However, because 68% of all scores fall into the 85-115 range, anything above 115 can be classified as above average. ## What is the highest recorded IQ score? It’s difficult to accurately identify history’s highest IQ score, since the test was designed with a more average intellect in mind. Individuals who are extreme outliers would be better measured by a separate IQ test. 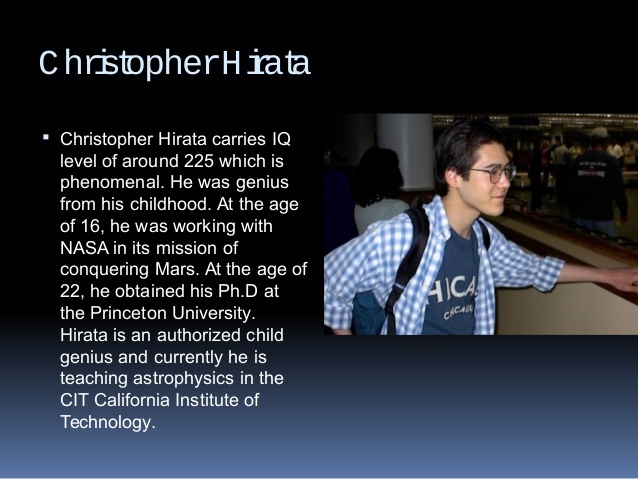 Christoper Hirata -- one smart cookie! Another possible contender is William James Sidis, who was born in 1898 and is said to have known eight languages by the age of eight. He entered Harvard at age 11 to study mathematics. When he took an IQ test, he was too far off the charts to be accurately measured, but Abraham Sperling, the director of the New York City’s Aptitude Testing Institute, claimed that Sidis’s score was easily between 250 and 300. IQ test scores worked differently when Sidis took the test than they do now, so Sperling’s claims likely indicated that Sidis had a score 2.5-3 times greater than expected for his age. The truth and meaning of this claim have been debated over the years, so it’s hard to pinpoint an actual IQ score for Sidis. To put these genius IQ scores in perspective, Stephen Hawking, the acclaimed physicist who wrote A Brief History of Time, has an IQ score of “only” 160. ## What are the different types of IQ tests? There are many different IQ tests, but they typically measure verbal intelligence, numerical intelligence, spatial intelligence, and logical intelligence. The first IQ test was developed by psychologist Alfred Binet, who was commissioned by the French government to help develop a way to identify students who were likely to struggle in school and thus were in need of specialized assistance. Binet and his colleague Theodore Simon developed questions focusing on skills not explicitly taught in school, such as memory, problem-solving skills, and attention. Binet suggested the concept of mental age, measuring intelligence based on the average abilities of children within a specific age group. The test was called the Binet-Simon Scale. In the United States, it was standardized using a sample of American participants by Stanford University psychologist Lewis Terman. The adapted test was published in 1916 and called the Stanford-Binet Intelligence Scale, and it soon became the United States’ standard intelligence test. In fact, it continues to be the gold standard in IQ tests, particularly for children. For each of the five factors, the SB offers a verbal portion and a nonverbal portion, comprising the ten subtests. Each nonverbal portion involves pointing or assembling manipulatives. Test subjects receive an overall IQ score, a nonverbal score, a verbal score, and total IQ scores for each subtest. The SB is often preferred among young children because it features more colorful artwork, toys, and manipulatives. However, very young children tend to perform poorly because they lack sufficient concentration to complete the entire test. Even reading about the SB can make your head spin, never alone taking it! There are two types of Woodcock Johnson tests, but the type that best correlates with other IQ tests, particularly for kids, is the Woodcock Johnson Tests of Cognitive Abilities. This series of subtests is individually administered to children as young as two. Comprehension-Knowledge Long Term Retrieval Visual-Spatial Thinking Auditory Processing Fluid Reasoning Processing Speed Short-Term Memory Quantitative Knowledge Reading-Writing Ability If your child is assessed using the WJ, the amount of subtests your child takes will depend on whether your child takes the Standard Battery (10 tests) or the Extended Battery (20 tests). Sometimes a full battery is not administered. Either way, the WJ is believed to give a very detailed understanding of a child’s intelligence, and each subtest should take about five minutes. The WISC is today’s most widely used individual IQ test in schools. It is divided into subtests that are designed to measure specific skills, making it an excellent assessment for determining information about learning styles, as well as strengths and weaknesses. The test can be individually administered to children ages 6-16 years and 11 months. For most children, the test takes 65-80 minutes to complete. The test can be taken online or via paper, pencil, and manipulatives. The skills on the test are divided into two major skill types: verbal and performance. Upon scoring, students will receive an overall I Q score, a verbal IQ score, and a performance IQ score. 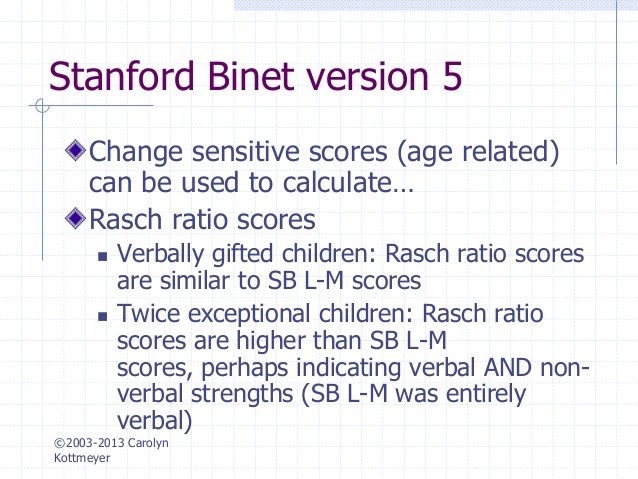 Scores are based on a comparison to other children of the same age. Subtests include questions related to general knowledge, English vocabulary, traditional arithmetic, completion of mazes, and arrangement of pictures and blocks. Students are tested on verbal comprehension, fluid reasoning, visual spatial skills, working memory, and processing speed. Reading and writing are not required. The DAS-II is an individually administered battery of cognitive and ability tests for children ages 2 years and 6 months to 17 years and 11 months. The battery consists of 20 subtests that assess skills such as immediate and delayed recall, visual recognition and matching, phonological processing, understanding of basic number concepts, processing and naming speed, and visual and working memory. The test takes about 90 minutes to complete, depending on which subtests are administered. Of course, the tests mentioned here are a few examples of some of the most commonly used IQ tests for children. However, there are additional alternatives available. The greatest advantage of IQ testing is that it helps parents and teachers determine if a student needs additional guidance or additional challenges in school. Understanding a student’s cognitive strengths and weaknesses can be tremendously helpful to educators. Additionally, knowing your child’s IQ at a young age can help you address cognitive weaknesses, nurture and explore cognitive strengths, and work toward improvement as your child grows and matures. These tests can help place students in an academic environment and curriculum that best meets their intellectual needs. If you believe your child is gifted and may need specialized academic instruction, we also have information about accommodations that gifted students need. However, some argue that labelling students creates a “self-fulfilling prophecy.” For example, a student who is labeled as struggling or learning disabled may feel she is not capable of academic success and won’t bother trying. Meanwhile, gifted students may view this label as an excuse to “coast” academically, making minimal effort. Additionally, some psychologists argue that IQ tests offer a very limited view of the many types of human intelligence. Others feel that IQ tests truly only measure test-taking abilities, rather than serving as a true measure of intelligence. ## How can you improve your IQ score? Now that we’ve covered all the basic questions, from “What is the average IQ score” to “What are the different types of IQ tests,” we need to talk about how to improve a low or disappointing IQ score. IQ tests are designed to measure innate ability, meaning they intend to measure skills that cannot be taught in school, studied, or otherwise coached. However, you can help your child improve her IQ score by practicing test concepts and completing sample test questions. Although test concepts may vary according to the test your child takes, these typically include topics like basic number skills, word relationships, memory, vocabulary, and patterns. You can practice these skills with workbooks, puzzles, academic games, activities, or even in normal conversation. For example, begin talking to your child about more, less, and equal, or about word relationships such as synonyms, antonyms, and whole-part. Practice questions are the most effective way to improve an IQ score. Since IQ tests are specifically designed to be different from typical classroom experiences, practicing the question types can help your child build familiarity and confidence beforehand. Initially, practice with no time constraints so your child can learn how to approach the questions at her own pace. As she answers, ask her to explain each response. This gives you the opportunity to reinforce logical reasoning and to correct misconceptions as needed. If your child gets an answer wrong, talk about what went wrong, why the correct answer is indeed correct, and how to approach the problem differently in the future. Answering questions without discussing and revisiting them is a pointless endeavor. Once your child has become more confident and skillful at answering practice questions, we recommend having her take at least one or two full-length practice tests. If the test is timed, the full-length practice tests should be as well, in order to give your child a feel for the pacing of the test. Taking a full-length practice IQ test also helps your child build focus and stamina, which are much-needed on most IQ tests. If the practice test reveals any particular weakness, you can focus more on that specific question type moving forward. We hope we’ve answered all of your IQ questions, from basics like, “What is the average IQ score?” to more in-depth information about how to improve an IQ score that doesn’t fully reflect your child’s abilities.